There are an infinite number of ways chicken is prepared and served in Chinatown, here’s ten must-eat dishes and where to sample them. If a man is tired of chicken, he is tired of life. That might be a slight deviation from Samuel Johnson’s infamous proclamation but it’s pretty true. And nowhere more apt is it than in Chinatown where chicken is cooked in a million and one ways. 2017 is the year of the rooster so let’s get clucking and check out the many finger-licking, lip-smacking places and styles you can experience chicken in Chinatown London. Chicken breasts as large as your head; what better way to bring in the Year of the Rooster? Forget KFC, Taiwanese fried chicken is the best in the world; a thick crispy coating either marinated in soy or garlic, or sprinkled with a flavoured seasoning post-frying. For show-stopping fried chicken breast as large as your head, make a beeline for Good Friend. Royal Dragon’s B kung pao chicken sure kung-paos your taste buds. Sweet and sour cubed chicken, flash-fried with veg, kung pao chicken is probably Westerners’ most beloved Chinese chicken dish and a mainstay across most Chinatown restaurant’s menus. Originally a super-hot Sichuan dish, it’s become milder over the year to suit Western palettes. 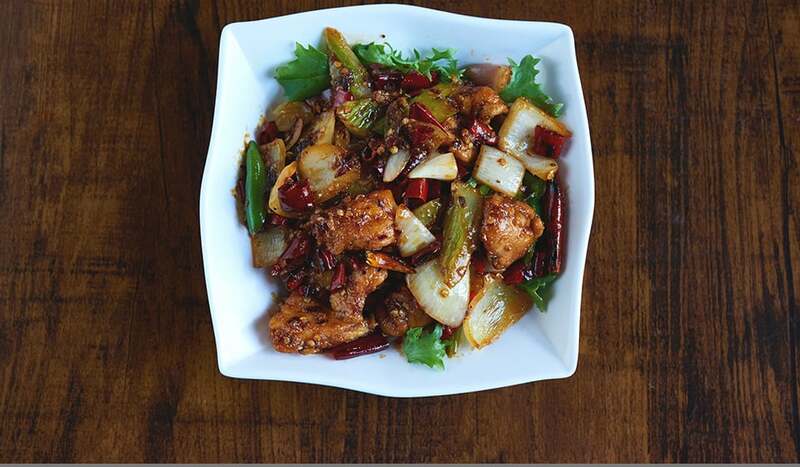 Royal Dragon’s kung pao chicken sure kung-paos your taste buds. 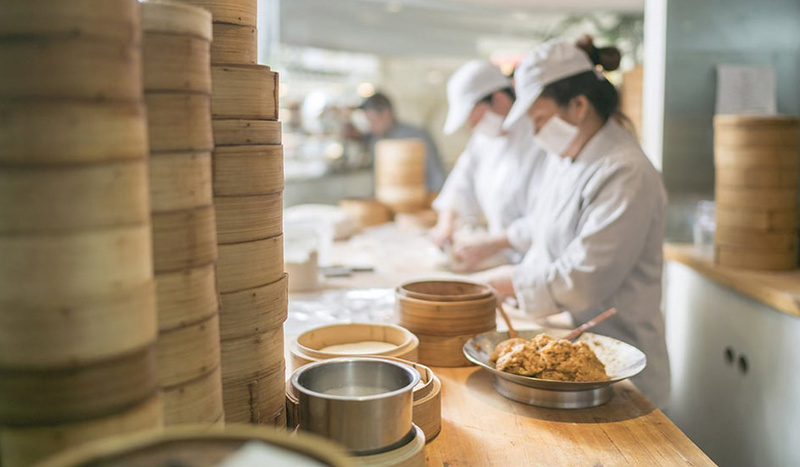 Using chopsticks, pick up a tightly packed xiao long bao, dunk in vinegar and ginger, bite into the translucent white dumpling skin and devour the meaty chicken filling housed within. Dumplings Legend’s dumplings are, well, legendary so pay a visit to sample their chicken-stuffed parcels of paradise. Served dry or in a mouth-tingling hot sauce, chili shredded chicken is one power-punching dish. Thin strips or shreds of chicken are lightly battered and wok fried with chili and veggies like pepper or spring onion. Experience its mouth-numbing umami at London Chinatown Restaurant. Delicious harmony of tender chicken breast chunks offset with crunchy cashews. 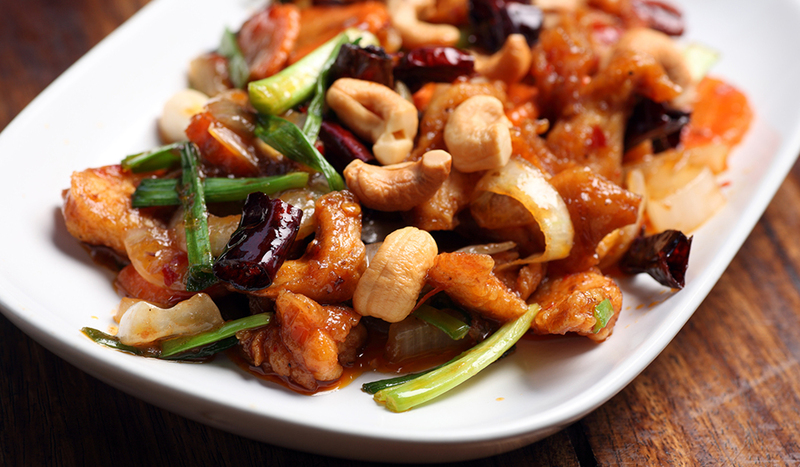 A dish that became popular Stateside when Chinese restaurateurs arrived in the USA, chicken with cashew nuts is a delicious harmony of tender chicken breast chunks offset with crunchy cashews. Wok-fried in Shaoxing rice wine, this classic Chinese-American dish can be enjoyed at New China London. This classic Taiwanese dish’s name is derived from the equal ratio of soy, rice wine and sesame oil used to flavour skin-on chicken thighs. With added ginger, garlic and chili it’s a feisty little number not shy of taste. Leong’s Legend is where you can get your three-cup fill. Baking meat and fish in a heavy coating of salt may be something of a dining trend these days but it’s been a traditional Chinese cooking method for years. After coating the chicken in spaces and stuffing with herbs it’s wrapped in parchment and buried in salt in a wok. 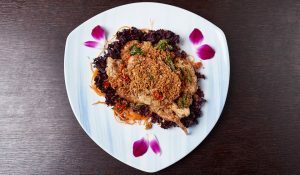 Tender and aromatic, why not devour a whole or half salt baked chicken at Lotus Garden? At Le Hanoi you can slurp on pho made with chicken drumsticks or breast. 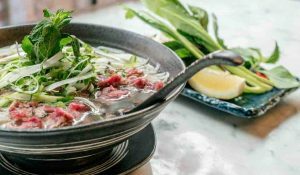 Vietnam’s unofficial national dish, pho is a light, mild flavoured broth with taste-enhancing DIY herbs and seasoning. 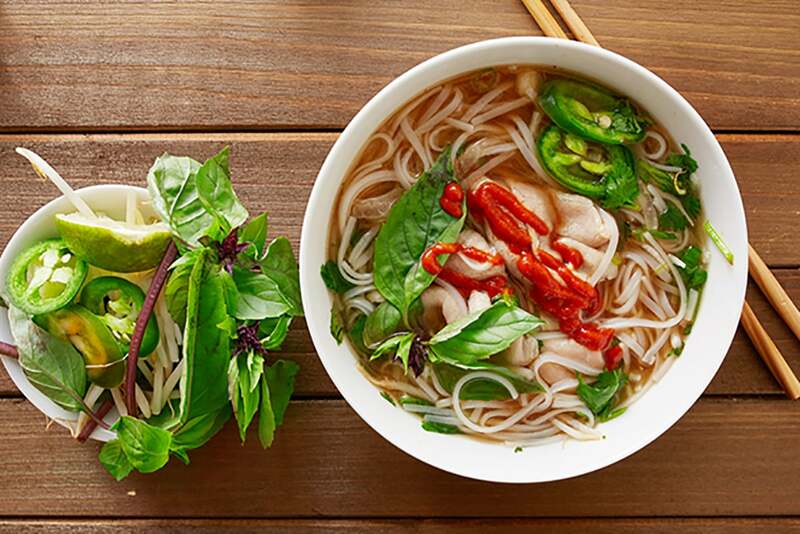 It’s served with almost any meat type you can think of but a chicken pho works wonders with its delicate nature. At Le Hanoi you can slurp on pho made with chicken drumsticks or breast. Think of it as a kind of savoury jam roly poly – and instead of jam the roll is filled with chicken floss; a dried chicken with a threadlike texture. 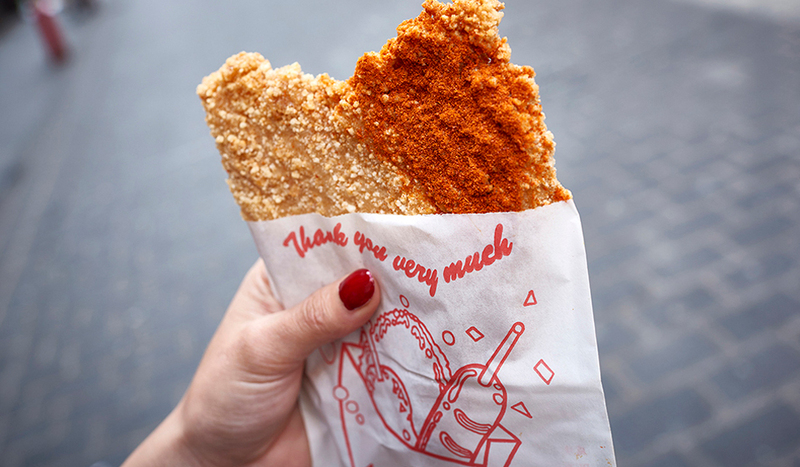 A delicious, popular Chinese snack, especially around New Year, fresh chicken floss rolls are hot out the oven at Chinatown Bakery. A traditional Chinese folk snack, wontons are a type of dumpling made from square dough paper, and filled with ground chicken and spices. Boiled in soup or deep-fried, the regional variations are endless. Gorge on all you can eat chicken wontons at Mr Wu Buffet on Shaftesbury Avenue.